Routine, rapid visualization of the retinal periphery will facilitate earlier diagnosis, more accurate evaluation, and better treatment outcomes. The rising incidence of diabetes in the US population and the cresting wave of Americans entering old age will ensure that diabetic retinopathy (DR) remains one of the principal threats to the sight of adult patients and a significant management challenge for the clinical community. As retina specialists adapt to these demands, the use of multimodality ultra-widefield (UWF) retinal imaging (Optos) is making important contributions to the evolving understanding of the DR disease process, ongoing efforts to increase early diagnosis and improve treatment outcomes, and the persistent search for enhanced efficiencies in delivering care. Figure 1. UWF color image of proliferative DR with DME. Figure 2. UWF FA showing peripheral vascular changes due to DR.
A rapidly growing body of clinical evidence is changing the way we think about DR, including the conventional severity scale. For example, once patients reach the established criteria of the “4-2-1” rule for severe nonproliferative DR, the disease is already likely to have progressed beyond where it might have if treatment had been initiated based on findings from the periphery. Conversely, even if we identify only a few microaneurysms in a standard assessment, a UWF FA might reveal extensive nonperfusion in the periphery. Knowing that peripheral nonperfusion is highly correlated with disease progression, we would likely want to see a patient with these findings every 3 months. Figure 3. UWF color image of nonproliferative DR with peripheral changes. Figure 4. UWF FA showing proliferative DR with extensive peripheral nonperfusion. More fundamentally, our hypotheses about the etiology of DR and DME—and the treatment approaches based on these understandings—are evolving as a result of UWF imaging. 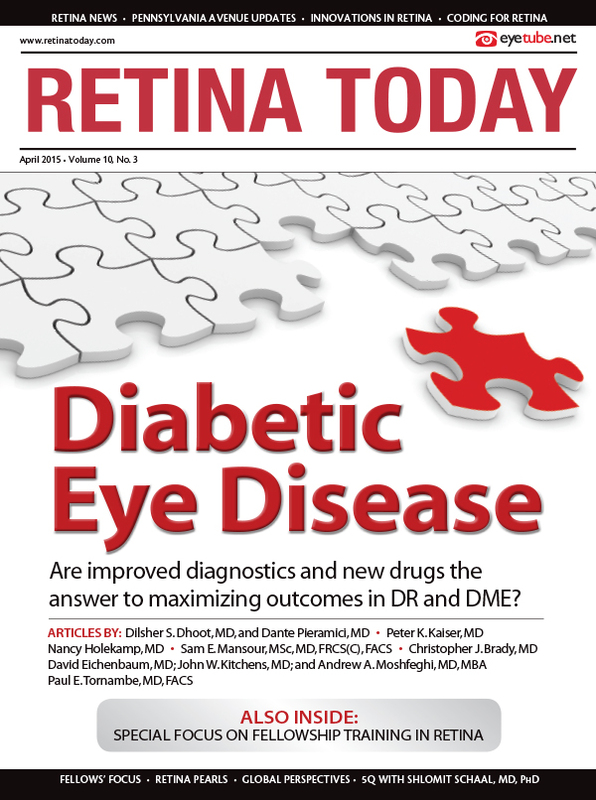 It is increasingly clear that DME is primarily a disorder of the retinal periphery that only secondarily affects the macula, and that it has two distinct presentations, acute and chronic. In patients with diabetes, the retinal capillaries shut down due to the loss of pericytes in response to hyperglycemia, so retinal tissue is not oxygenated and given nutrition. In the acute phase, VEGF is released, and its mechanistic role can be confirmed by the dramatic response to VEGF inhibitors that has been documented in clinical trials. In our clinic, we have found that down-regulating VEGF by treating the ischemic retina with a VEGF inhibitor, followed by targeted PRP, can be a very effective way to resolve DME. Because PRP can up-regulate VEGF, we administer two additional VEGF inhibitor injections a month apart. If DME remains unresolved, a new UWF angiogram can help determine if all areas of nonperfusion have been adequately treated and if additional PRP is warranted (Figures 5 and 6). Figure 5. UWF FA illustrating previous PRP and areas with new neovascularization. Figure 6. Color UWF image showing previously treated proliferative DR with clinically significant DME. Integrating UWF imaging into the management of patients with diabetes has practical benefits in addition to clinical advantages. The ability to perform single-capture, nonmydriatic UWF imaging allows the clinician to make more efficient use of his or her time by facilitating quick evaluation of the status of the retina in a new patient. It is no longer necessary to search laboriously with an indirect ophthalmoscope and perform a contact lens examination with drawings—the optomap displays exactly what is going on and gets the physician up to speed within seconds, whether the image was captured in the office or at a remote location. This allows more face-to-face discussion time with the patient, improving patient satisfaction. The optomap is also useful for educating the patient about his or her condition and its likely progression, thereby supporting better compliance, which in turn may help patients preserve visual acuity. Paul E. Tornambe, MD, FACS, is director, San Diego Retina Research Foundation, and president, Retina Consultants, San Diego. He is a consultant for DORC, Insight Instruments, Optos, and Zeiss. Dr. Tornambe may be reached at tornambepe@aol.com. 1. Kaines A, Oliver S, Reddy S, Schwartz SD. Ultrawide angle angiography for the detection and management of diabetic retinopathy. Int Ophthalmol Clin. 2009;49(2):53-59. 2. Kernt M, Hadi I, Pinter F, et al. Assessment of diabetic retinopathy using nonmydriatic ultra-widefield scanning laser ophthalmoscopy (optomap) compared with ETDRS 7-field stereo photography. Diabetes Care. 2012;35(12):2459-2463. doi:10.2337/dc12-0346 1935-5548. 3. Kernt M, Pinter F, Hadi I, et al. Diabetic retinopathy: comparison of the diagnostic features of ultra-widefield scanning laser ophthalmoscopy Optomap with ETDRS 7-field fundus photography [article in German]. Ophthalmologe. 2011;108(2):117-123. 4. Silva PS, Cavallerano JD, Sun JK, et al. Nonmydriatic ultrawide field retinal imaging compared with dilated standard 7-field 35-mm photography and retinal specialist examination for evaluation of diabetic retinopathy. Am J Ophthalmol. 2012;154(3):549-559.e2. doi:http://dx.doi.org/10.1016/j.ajo..2012.03.019. 5. Wessel MM, Aaker GD, Parlitsis G. et al. Ultra-wide-field angiography improves the detection and classification of diabetic retinopathy. Retina. 2012;32:785-791. 6. Kong M, Lee MY, Ham DI. Ultrawide-field fluorescein angiography for evaluation of diabetic retinopathy. Korean J Ophthalmol. 2012;26(6):428-431. 7. Silva PS, Cavallerano JD, Sun JK, et al. Peripheral lesions identified by mydriatic ultrawide field imaging: distribution and potential impact on diabetic retinopathy severity. Ophthalmology. 2013;120(12):2587-2595. 8. Manjunath V, Papastavrou V, Steel DHW, et al. Wide-field imaging and OCT vs clinical evaluation of patients referred from diabetic retinopathy screening [published online ahead of print January 16, 2015]. Eye (Lond). doi:10.1038/eye.2014.320. 9. Wessel MM, Nair N, Aaker GD, et al. Peripheral retinal ischaemia, as evaluated by ultra-widefield fluorescein angiography, is associated with diabetic macular oedema. Br J Ophthalmol. 2012;96(5):694-698. doi: 10.1136/bjophthalmol-2011-300774. 10. Kim DY, Kim J-G, Kim YJ, et al. Ultra-widefield fluorescein angiographic findings in patients with recurrent vitreous hemorrhage after diabetic vitrectomy. Invest Ophthalmol Vis Sci. 2014;55:7040-7046. 11. Patel RD, Messner LV, Teitelbaum B, Michel KA, Hariprasad SM. Characterization of ischemic index using ultra-widefield fluorescein angiography in patients with focal and diffuse recalcitrant diabetic macular edema. Am J Ophthalmol. 2013;155(6):1038-1044. 12. Silva PS, Cavallerano JD, Haddad NM, et al. Peripheral lesions identified on ultrawide field imaging predict increased risk of diabetic retinopathy progression over 4 years [published online ahead of print February 19, 2015]. Ophthalmology. doi:10.1016/j.ophtha.2015.01.008. 13. Muqit MM, Young LB, McKenzie R, et al. Pilot randomised clinical trial of Pascal TargETEd Retinal versus variable fluence PANretinal 20 ms laser in diabetic retinopathy: PETER PAN study. Br J Ophthalmol. 2013;97(2):220-227. 14. Wang Y, Muqit MMK, Stanga PE, et al. Spatial changes of central field loss in diabetic retinopathy after laser. Optom Vis Sci. 2014;91:111-120. 15. Boynton GE, Stem MS, Kwark L, et al. Multimodal characterization of proliferative diabetic retinopathy reveals alterations in outer retinal function and structure [published online ahead of print January 16, 2015]. Ophthalmology. doi: 10.1016/j.ophtha.2014.12.001. 16. Leicht SF, Kernt M, Neubauer A, et al. Microaneurysm turnover in diabetic retinopathy assessed by automated RetmarkerDR image analysis – potential role as biomarker of response to ranibizumab treatment. Ophthalmologica. 2014;231(4):198-203. 17. Suner IJ, Peden MC, Hammer MK, et al. RaScaL: A pilot study to assess the efficacy, durability, and safety of a single intervention with ranibizumab plus peripheral laser for diabetic macular edema associated with peripheral non-perfusion on ultrawide-field fluorescein angiograpy [published online ahead of print November 26, 2014]. Ophthalmologica. doi:10.1159/000367902. 18. Brown DM, Nguyen QD, Marcus DM, et al. Long-term outcomes of ranibizumab therapy for diabetic macular edema: The 36-month results from two phase III trials (RISE and RIDE). Ophthalmology. 2013;120(10):2013-2022. 19. Tornambe P, London N. Is DME a peripheral retina disease which secondarily involves the macula? Paper presented at: Argentine Retina Society Meeting; November, 13-15, 2014; Mendoza, Argentina. 20. Silva PS, Cavallerano JD, Tolls D, et al. Potential efficiency benefits of nonmydriatic ultrawide field retinal imaging in an ocular telehealth diabetic retinopathy program. Diabetes Care. 2014;37(1):50-55. doi:10.2337/dc13-1292 1935-5548.